Over the weekend, the Miami Marlins sent Giancarlo Stanton to the Yankees for a package of players that is honestly not even worth mentioning here. The transaction that took place was made in such profoundly bad faith that “trade” seems too kind a word to attach to it. 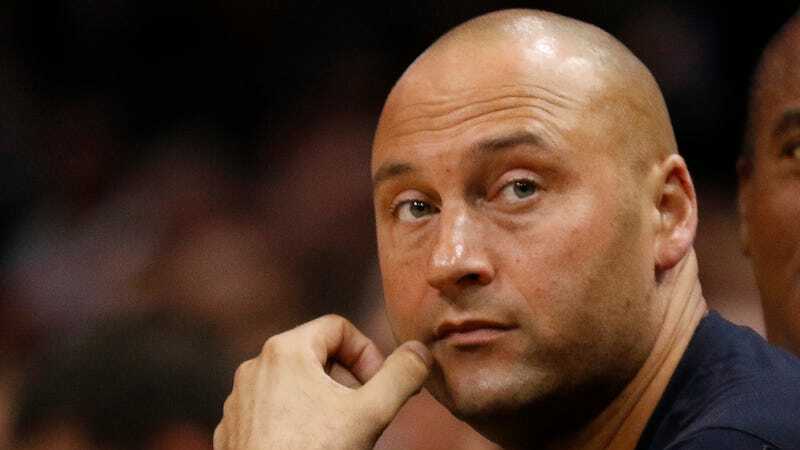 This was nothing more than the Marlins’ new ownership group, bankrolled by Bruce Sherman and led by Derek Jeter, scrambling to get Stanton’s $295 million contract off the team’s books. What they got back didn’t really matter much, and that is plain to see in what they got back. Stanton, the reigning National League MVP, is 28 years old; he is the best power hitter in the game and worth every bit of that contract. The issue is not that he is getting paid too much. The issue is that Sherman and Jeter bought a team they couldn’t really afford, and that MLB allowed them to do it despite knowing that. According to USA Today, the group took on $400 million in debt. And so the first order of business for the Marlins’ new owners, before anything to do with improving the team, was to cut salary. So there goes Giancarlo Stanton, and there goes Dee Gordon, too. There is no shortage of people to blame for this disaster. Sherman, who reportedly owns 46 percent of the team and thus has the biggest motivation to cut salary, is an easy target. So too is Jeter, who owns just four percent of the team but is the organization’s CEO and oversees the day-to-day operations. He’s the new face of the franchise, and he knew what he was signing up for. Blame commissioner Rob Manfred, for allowing the sale to go through knowing that the ownership group’s $400 million in debt was going to be paid off in franchise-destroying fashion. Go ahead and be mad at former owner Jeffrey Loria, too, a cynical slimeball even by the standards of defective sports owners, and someone who gave Jeter and Sherman the playbook for executing just this kind of teardown.